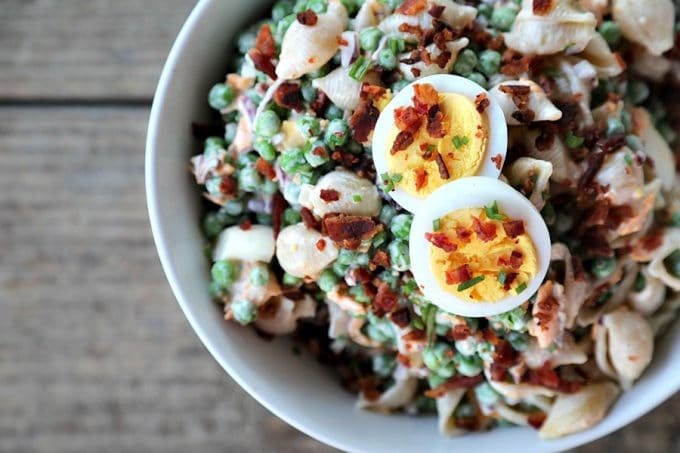 The sweet pop of tender baby peas, creamy dressing, crunchy red onion, hard-boiled eggs, and crispy bacon join forces with shell pasta in your new favourite side dish: Easy Bacon Pea Pasta Salad. With Easy Bacon Pea Pasta Salad, your meal is easy peasy. It’s time to bring the grill back out, brush off those grilling tools, and get your strappy sandals ready. The weather is warming back up. With the sunshine making a return, we want to be in and out of the kitchen like a flash. Everyone wants to soak up the sun that was missing all winter long. Our Easy Bacon Pea Pasta Salad is the happy result of re-envisioning our perennially popular easy bacon pea salad as a heartier, more substantial pasta salad. And OH what a delicious decision that turned out to be. The sweet peas, crunchy bacon, shredded cheddar, hard-boiled egg, and paper-thin slices of red onion in creamy sauce seem to nestle perfectly into our shell pasta like a pasta package of happiness. Each and every bite packs a pop of flavour. Like most pasta salads, this one is easily made ahead of when you need it, and in fact, is even better when made a day in advance of when it’s needed. It is, however, at its best when served within three days of being made. I love Bacon Pea Pasta Salad served on its own as a light meal, but it also makes a perfect accompaniment to all sorts of grilled or roasted meats like chicken, pork, beef, sausages, hamburgers, or hot dogs. You don’t need to cook the peas! In fact, please do not cook the peas. Peas are blanched before they’re frozen to keep them from turning to mush in the freezer and that’s all the cooking they need for a salad. Simply thaw them in the refrigerator overnight or in a bowl in the microwave. I don’t recommend using canned peas in the Easy Bacon Pea Pasta Salad. I don’t think they have the texture for the job. Cook the shell pasta to firm but not quite al dente. When it’s done, drain it in a colander then rinse thoroughly with cold water. This stops the pasta from cooking any further and rinses off the starches that might otherwise cause it to clump. Drain well before proceeding with the recipe. I prefer to mix all of the ingredients but the pasta together first, then toss in the rinsed pasta. Toss gently, because the peas and pasta are both delicate. I love the hint of pickle brine in our Bacon Pea Pasta Salad. You can substitute an equal amount of cider vinegar or white wine vinegar if you don’t have pickle juice handy. If you happen to have horseradish pickle brine, that is terrific in this salad! Let’s talk bacon. This is one time when the crispy vs. chewy debate can be shelved. Go crispy. You want crunchy little nuggets of bacon interspersed in the salad. Besides, it’ll be sitting in the creamy dressing softening up, so you starting with crisp bacon will ensure it maintains some texture as it sits. Speaking of sitting, this salad benefits from a at least an hour in the refrigerator prior to serving. If you don’t have the time, it’s still tasty, but it is divine when given one to twenty four hours to rest in the refrigerator. If the dressing is soaked up by the pasta while the Bacon Pea Pasta Salad rests, you can stir in a little mayonnaise or ranch dressing to loosen it back up prior to serving. Do you love this Easy Bacon Pea Pasta Salad? Try these other salads out! 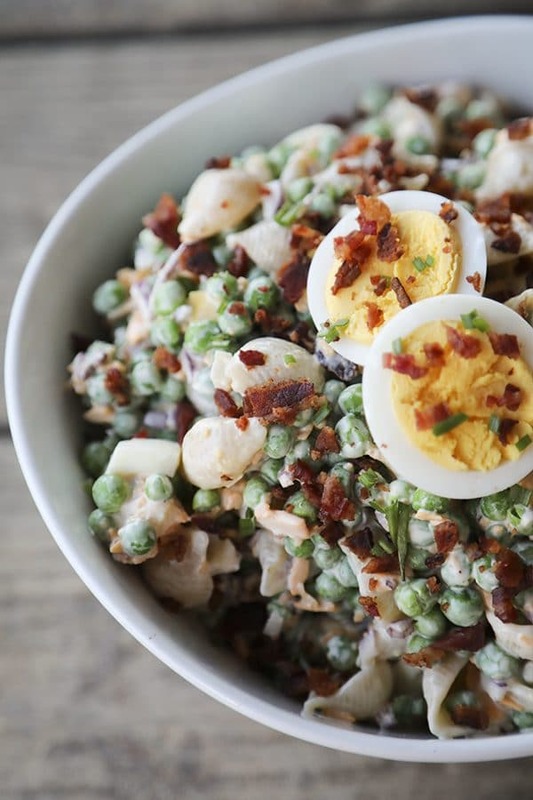 The sweet pop of tender baby peas, creamy mayonnaise dressing, crunchy mild red onion, chopped hard-boiled eggs, and crisp bacon join forces with shell pasta in your new favourite spring and summer dish: Easy Bacon Pea Pasta Salad. 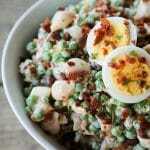 In a large mixing bowl, gently stir together the peas, bacon, red onion, hard-boiled eggs, cheese, mayonnaise, and pickle brine or vinegar until evenly combined. Gently toss in the cooked pasta until everything is evenly distributed. Serve immediately, or (preferably) put in a tupperware, Gladware, or other tightly covered container in the refrigerator to give the flavours a chance to meld for an hour but up to three days prior to serving. Give it a gentle stir from top to bottom before serving. If the pasta soaks up the dressing and it seems a bit dry, stir in a little extra mayonnaise or add ranch dressing, 1 tablespoon at a time until the dressing reaches desired consistency. I think you’ll love it, Rie! What could be used in place of peas? Peas are the one vegetable I just do not like. Do you think broccoli would work? I have a broccoli pasta salad here on the blog! Thank you Rebecca – that looks delicious! I’m going to try it this week. Hey Deni- I know that sounds a little crazy, but I find the bacon combined with the pickle brine actually adds enough salt for the recipe. Crazy, because I add salt to almost everything in pretty large quantities. I even salt some brands of potato chips! Of course, you’re welcome to adjust that if you taste it and find it needs a little boost! As for pepper, I serve this with our pepper grinder on the side because each of our family members has vastly different black pepper preferences. Feel free, again, to add it to taste for yourself.